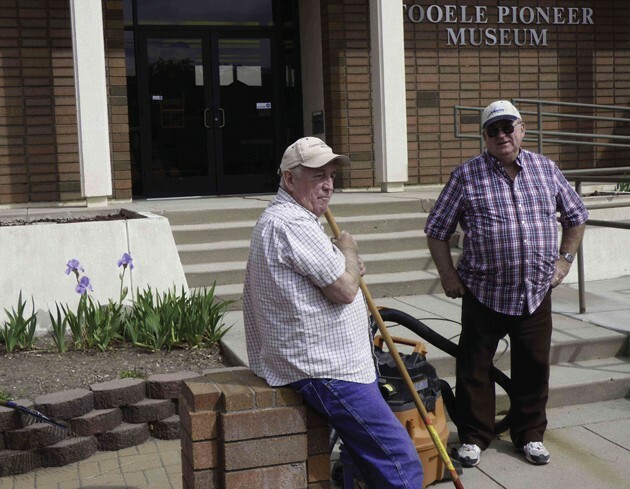 Glen Stevens and Tim Booth prepare the grounds of the Tooele Pioneer Museum for its May 1 opening date. 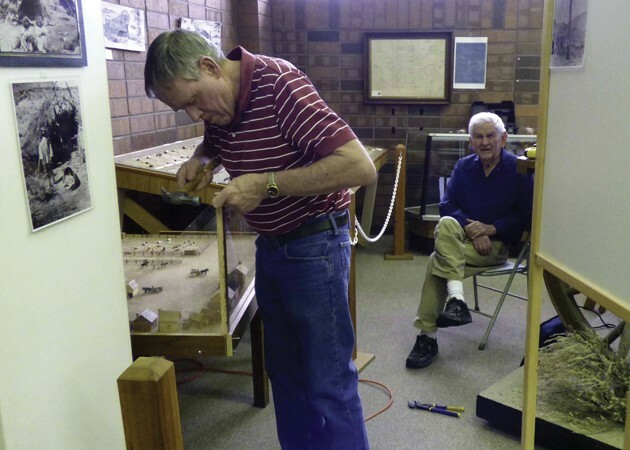 John Bryan and Jim Bevan have been busy installing new lighting and displays at the Tooele Pioneer Museum in preparation for the 2015 season. The volunteer staff of the Tooele Pioneer Museum at 47 E. Vine S. in Tooele is busily getting ready for the 2015 season opening on May 1-2. The 2015 season will run until September 26th which is also National Museum Day. The museum will be open every Friday and Saturday from 10 a.m.-4 p.m. Other group openings at other times can be arranged by contacting Tim Booth at (435) 882-1902. 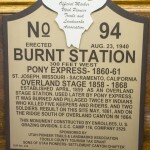 The Tooele Pioneer Museum displays the county’s happenings from historic Lake Bonneville through today. One of the major draws of this museum is Lee Nix’s complete display of Indian artifacts. You won’t believe how this one man has spent his life in the wilderness and deserts of Tooele County so he can educate others on Tooele’s earliest inhabitants. Along with new lighting in the display cases, Lee has on hand some new, very old items that you’ve got to see to believe. 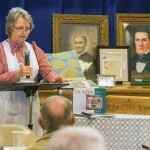 After learning about our Native Americans, come see presentations of early Tooele County and the first white men to enter the valley as well as our earliest pioneer settlers that made living in the county what it is today. Come marvel at the work accomplished and skills needed to tame the desert, bring life giving water to their animals and crops, and provide protection for their families. See a model of the old mud fort, where it was located and how it was made. It is a testimonial to these forward-thinking and hard-working forefathers. You will be able to see, as well as have photos taken in, the huge Conestoga wagon that took a ton of work and expertise to just get into the building. The Conestoga wagons were the first tractor-trailers of the desert, and hauled the goods and equipment to the people much like semi-trucks do today. Still-functioning wind up phonographs, pedal-powered organs and hand-cranked cream separators — it’s all here. Come discover how the early shoemakers created their wares, and how the earliest phone calls all had to be connected by hand. Can you remember 484J please, and listening in on party lines? There are separate rooms decorated with period furniture and appliances. Discover how the city barbers were many times the dentists of their day with the meager equipment they had available. You’ll be glad you live today instead of then. 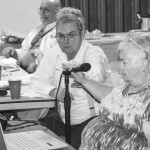 There are lots of old photos from pioneer days and farming and mining booms. It is truly a gem of a museum away from the swarms of the big cities. 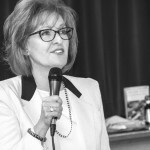 All of this is available for free, thanks to the Tooele County Tourism Grants, and healthy donations from Energy Solutions and others, including the Tooele Transcript Bulletin which so willingly publishes these articles for the education of the community, and helps in countless other ways. We can’t thank Tooele City enough for the buildings, repairs and utilities they so willingly donate to the cause of remembering our pioneer forefathers so hopefully we can learn from them and extend these gifts even better for our descendants to follow. We even have rooms available for clubs and organizations to schedule who have similar goals and values. For more info on all of this or if you would like to volunteer as a docent(which we really appreciate), give the Museum Director, Tim Booth a call at (435) 882-1902. See you in May!